For all of the eccentric and eclectic Porsche collectors and enthusiasts out there, we've decided that it is about time someone aggregated the best of the best that eBay has to offer in the Porsches-for-sale department. We've tracked down five exciting Porsches for folks to purchase today, including a well known GT3 from SharkWerks, a strangely captivating 959 replica, a super-quick 911 R replica, a slant-nosed G50 930, and an inexpensive turbocharged beater. Some of these cars could be great collection investments, while others might prove to do more financial harm than good. This is your opportunity to own a quite famous "tuner" Porsche GT3. The ever intelligent engineers of SharkWerks have been using this car as a test bed for their projects since 2007, and the time has come for it to change hands. It has been admittedly heavily modified, but only in the best ways. The car was a recipient of a SharkWerks 3.9 liter engine upgrade, a TechArt noselift kit and sport springs, a set of HRE C-21 wheels, a heavily sharkified exhaust, and a number of other winning touches. The bright green car certainly catches the eye, and has been featured in Excellence, European Car, Modified Luxury and Exotics magazine, and has been featured on a few television shows as well, including SPEED's Super Cars Exposed. ZKERMIT is shown for sale with 34,739 miles, and its 3.9 liter has been proven to produce 457 horsepower and 326 lb-ft of torque. Impressive numbers! The 924 Turbo of the early 1980s is probably the most underrated Porsche ever built. The driving dynamics of this car are fantastic, featuring almost exactly 50/50 weight distribution, thanks to a front-engine/rear-transaxle drivetrain layout. The turbocharged Audi-sourced 2.0 liter four cylinder is probably not the most powerful thing ever, but at 177 horsepower (more than the heavier 944 which was introduced 2 years following), it scoots the diminutive coupe's 2500-ish pounds in a decent manner, producing an impressive-for-the-time 7.7 second 0-60 time. While this car has been coated in a layer of plasti-dip, it is said to have less than perfect paint on underneath. Aside from that, the sellers claim the car to be in excellent condition, features no rust (normal, being a galvanized body), and is "turnkey, ready to go". The photos show a well preserved interior and everything does appear to be on the up and up. For a pretty small price, you could have a really fun Porsche to drive around for a while and sell for about what you bought it for. There is very little risk to a purchase like this, monetarily. This is a car that is just begging to be driven like a madman, build the revs, spool the boost, attack every corner with fervor. It'll leave you begging for more, I can almost guarantee that. Only sixty of these 5-speed G50 cars were built worldwide in 1989, and very few of those were equipped quite as well as this car was from the factory. When ordering his 930, the original owner of this car specified the rare and expensive slant-nose body, as well as a raised hub steering wheel, heated sport seats in "supple leather", short-throw gear lever, upgraded luggage compartment material, a sunroof, and a Blaupunkt Reno radio with associated amplifier. This lifted the MSRP of the car to over 100,000 dollars in 1989! After delivery, the owner decided to have some modifications carried out in the name of performance. MODE Inc. of Scottsdale, AZ fabricated an individual throttle body setup for the car, and a twin-plug ignition conversion. The brakes were upgraded to 993 Turbo "big reds", and the wheels were swapped out for 964 Turbo "speedlines", an attractive 18" 3-piece racing wheel. The car comes with receipts for about ten thousand dollars in recent service work. The car is said to be presented as near-perfect in every fashion. The car isn't exactly original, but it does look the part. The only real downside of purchasing this car is that it is for sale in Costa Mesa, California, and it will not ever pass California emissions regulations, and can never be street driven with California tags. It's awfully expensive, but might just be worth it to the right buyer. This lot is a bit strange, and will likely be polarizing among our readers. 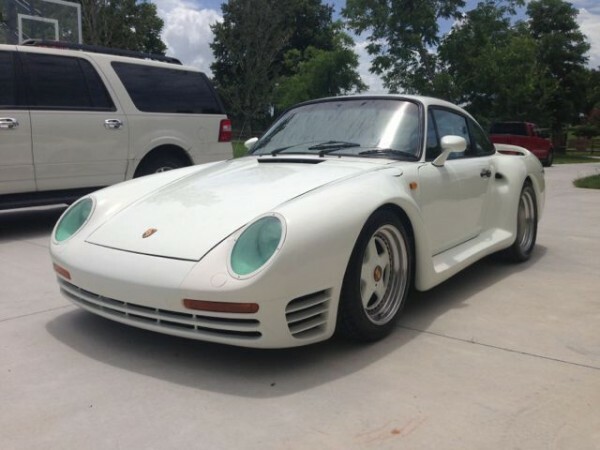 Originally a 1977 911, this car has been highly modified to resemble the late eighties supercar, Porsche's 959. The kit looks like a moderately convincing fake from the pictures, and might fool those not in the know. The rake of this car is a bit wrong, and some of the panel gaps are atrocious, that said, I've seen a lot worse. What this 959 lacks in show, it seems to be made up for in go. The car has received a 3.3 liter engine from a later 930 Turbo, and apparently has been modified to make quite a lot more power than stock. The seller claims more than 600 horsepower with an adjustable boost controller ranging from 0.7 to 2.0 bar of pressure. The car has also supposedly received a Ruf-modified G50 5-speed transaxle. Rolling stock is a set of 17" 3-piece OZ Racing wheels with 235 section-width front tires and 315 rears. With the 'race tuned suspension', all of that power sounds like a whole lot of fun, and I might value my life low enough to actually step behind the wheel for a while. If you can get over the 'replica' body panels, this could be a supremely interesting and fun to wrangle track rat. The buyer says the only downsides are a misaligned sunroof, a busted A/C system, and slow window motors. The 911R was Porsche's first foray into building a racing 911, and therefore is the car that sparked countless racing victories from that day forward. It was a fantastic car in its own right, and stands the test of time in terms of desirability and rarity. As such, a quality replica such as this one is at once difficult to find, and desirable in its own right. Given the chance, I'd probably rather drive this one over a real-deal 911R, as there were only 8 911R built in 1968, and I'd be too nervous to even consider driving it quickly. A good replica like this one, however, would make a great driver car, and I'd even consider taking this wild quasi-racer on a few morning commutes. 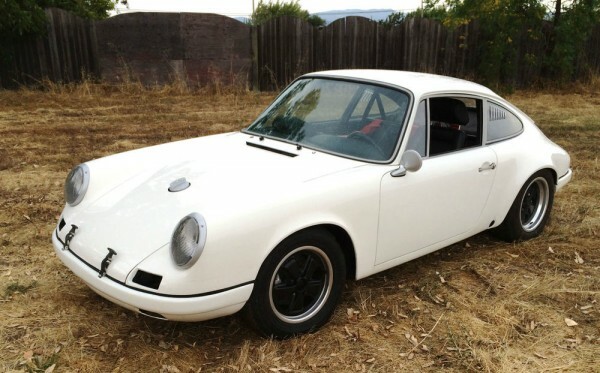 This R clone is said to be built on a very solid California-sourced 1966 3-gauge 912 chassis. It features fiberglass panels sourced from AIR, the rear fender flares however, are steel. The cornerstone of this build is a 280 horsepower flat six fashioned around an original 1967 aluminum case. The engine employs Carrello rods, Mahle cylinders with 11:1 JE pistons, twin plug RS cylinder heads, a JB Racing twin plug distributor, dual MSD ignition boxes, a Carrera 3.2 oil pump, ARP studs, modified Weber carburetors, stainless-steel headers, and a unique muffler. The transmission was also upgraded to an aluminum case 915 gearbox. The car's suspension and braking systems are sourced directly from a 1984 Carrera, including larger diameter torsion bars and Weltmeister front and rear adjustable sway bars. A custom fuel cell with a center filler has been installed, as well as a new fuel pump and a full bevvy of lines. The interior has been modified to include a pair of Recaro sport seats, racing harnesses, 911R style door panels, and a welded-in roll bar. The car is currently wearing a set of Fuchs (7X15 front and 8X15 rear), though the seller mentions they also have a set of vintage American racing wheels in 7X15 if the buyer prefers. Whenever I open these pages, the pricing and information details are missing. Andrew, could you be more specific? Are you referring to the eBay pages? If so, what country are you in?